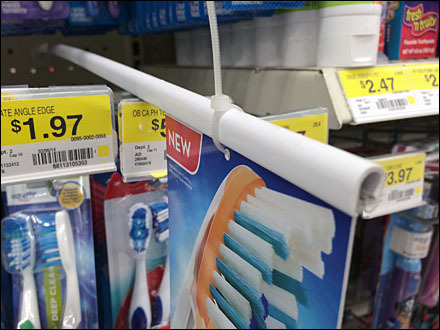 Straw- or tube-like, this simple device, supported by a Pegboard Stem Backplate creates a minimalist Pegboard Sign Tube Extension Aisle Invader. With the smallest of profiles imaginable, it can be inserted almost anywhere among pegged merchandise. CLICK through the Pegboard Sign Tube Extension gallery to see how it works as a Straight Entry device. Then visit “Sign Stem Peg” for the Backplate details in Closeup.